Verbs! Worksheets, centers, posters, and games! 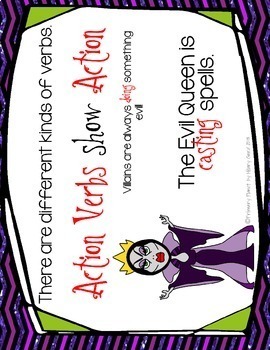 This product is a fun way to learn about verbs! 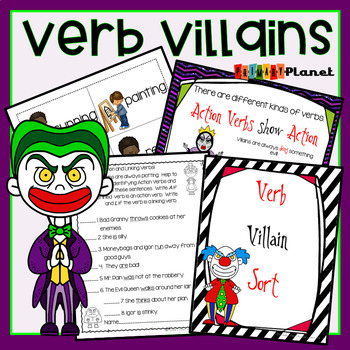 Help defeat the villains by learning about Action Verbs, Linking Verbs, Past and Present Tense verbs and Irregular Verbs! Your arsenal includes Posters, Games, and Worksheets! 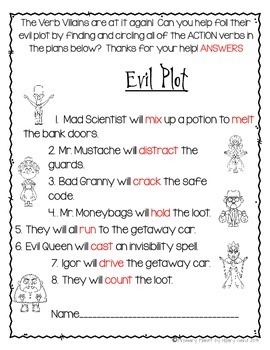 Looking for other fun Grammar Lessons and Activities? Practice page (to be copied double-sided) for each of the above skills. Also includes, answer keys, an action and linking verb classroom search, and an end of unit assessment.